At CPS we provide a variety of roller conveyors including, gravity rollers, driven rollers, accumulating roller conveyors and zero pressure roller conveyors. Our extensive range of systems ensures we can recommend and cater for all client requirements. Gravity roller conveyors are the basis of most package handling installations because of simplicity, economy and negligible maintenance requirements. CPS supply roller conveyors in a wide range of types and sizes, to suit the individual project requirements. Throughput of the conveyed goods can be precisely determined. Accurate positioning of goods carried on the assembly line is possible. The goods can be automatically diverted on or off the conveyor. Our Sales Engineers will be happy to advise and assist you in determining your requirements. The zero pressure roller conveyor system is designed for non-contact accumulation and buffering of sensitive or fragile loads. The conveyor is equipped with logical sensors and can therefore also be independently operated from an overall material flow control system e.g. stand-alone mode for manually actuated release of queues. 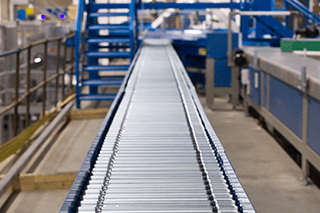 In this way non-automated conveyor systems can be updated with accumulating and buffering tracks. When integrating into an automated system only start and stop signals are required. After the unit loads have run in, individual independent track segments are disconnected from the drive whilst simultaneously decelerating the rollers in that segment. This allows for throughput speeds of up to 3600 units depending on the material being carried.